In addition, I also offer calligraphy services for any occasion and purpose. Starting with seating chart for your guests made with calligraphy letters on a chalkboard, paper, or any other material (no matter the size) and ending with a sign for your bedroom with your favorite quote, I've got it covered for you! Feel free to contact me if you have any questions and I will try to respond within an hour. However, allow up to 24 hours for response in some cases. The location of rentals is North Highlands, CA. We are Victor and Tanya Stypin family! 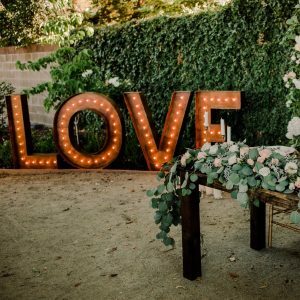 We just got married and we made a few custom decorations for our outside garden wedding. Most of these decorations were handmade by us and we would love for them to be useful for you as well!